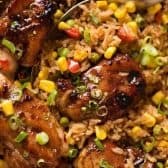 Baked Chinese "fried rice" AND Chinese Chicken all made in one baking pan! Mix Chicken and Marinade in a bowl. Set aside for at least 20 minutes, up to 24 hours. Place Rice ingredients, including oil, vegetables, soy sauce, cooking wine, stock and water, in a baking pan. Spread the rice out evenly. Remove chicken pieces from Marinade (reserving Marinade) and place on top - chicken will be partially submerged in the liquid. Cover with foil and bake for 20 minutes. Remove foil, baste chicken with remaining Marinade (dab it on generously), spray chicken with oil then bake for a further 30 minutes until chicken is caramelised, liquid is absorbed and rice is fluffy. If you want more caramelisation on the chicken, flick the broiler on for a few minutes. Set aside for 10 minutes before fluffing rice then serving, garnished with scallions if using. If you want to use chicken breast, put rice in oven without chicken. Then when you remove the foil, add the chicken breast on top of the rice at that stage.